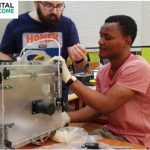 Participants of Digital Welcome in Barcelona, in addition to participating in the training and improving their digital and communication skills, have put their knowledge and skills into practice at the YoMo festival, a great fair where science and technology meets mobile. 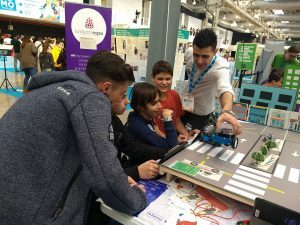 22,000 teenagers and educators have attended the YoMo festival this year and the young participants of Digital Welcome have had the opportunity to do their internships in this incomparable framework, offering a short workshop with robots and sensors. The proposal was based on the recreation of a city where, in the form of a game, different situations arise and they will have to be solved by programming robots and sensors. The objective within the game is to bring all the indicators that are represented in an interactive panel (health, coexistence, happiness, sustainability) to the highest level through cooperation among all participants. A model of an urban scenario was presented and the Digital Welcome Mentors introduced the challenges to overcome cooperatively among all the participants. 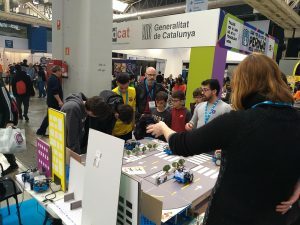 The main lessons learned in the activity are related to logical and computational thinking, programming of robots and sensors, teamwork and cooperation, environmental sustainability, and the application of technology in the improvement of quality of life and urban coexistence. More than 230 elementary students participated in the workshop following the guidelines of our Digital Welcome mentors. 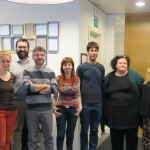 A very interesting moment was when some of the Digital Welcome mentors had the opportunity to explain to Francesca Bria, the Chief Technology and Digital Innovation Officer for the City of Barcelona, the proposal they were presenting to YoMo’s young visitors. She was really surprised and she encouraged them to keep continue their work. Not everything was easy, because some of the mentors are still learning our local language. However it was very enriching because the communication was very easy in relation to the activity, how to program the small robots and how to answer the small challenges. 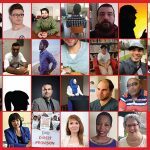 Have the Digital Welcome Mentors discovered a new vocation? The future will tell us. What we can affirm now is that, at the end of the activity, and after many hours of hard work, they said goodbye with a big hug, willing to continue working to improve their digital, social and communicative skills and competences. And we, Luismi and Núria, we’re very proud of the work they did.